“Dancing Lessons” is extended through April 9 at Virginia Rep at Hanover Tavern. Photo by Jay Paul. 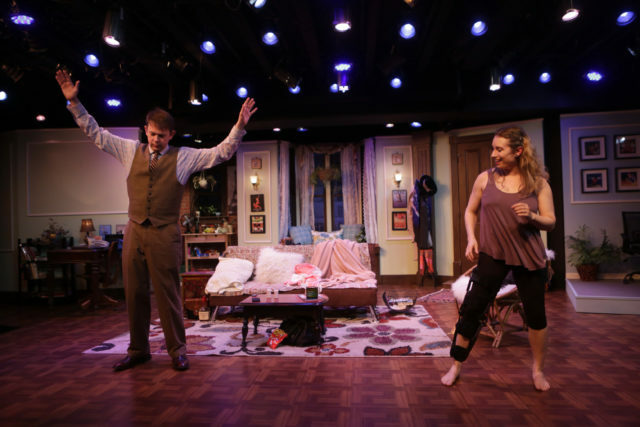 It’s often difficult to realize you’re not the only one facing problems, but that’s the real lesson learned in Dancing Lessons, playing at Virginia Rep’s Hanover Tavern. 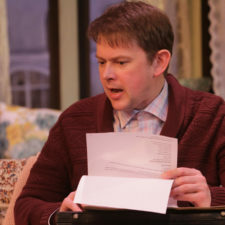 This light, airy show is able to make a serious point, and at the same time provide a hearty dose of laughter. The 70-minute production focuses on Senga, a professional dancer whose leg was injured in an accident, and her neighbor Ever, an introverted young professor with Asperger’s Syndrome. A scientific genius, Ever has no social barometer and blurts out whatever is in his head before he thinks about how it actually might sound. He tries to get Senga to teach him how to dance for an awards banquet he has to attend, but she refuses – until he offers her a large amount of money for one lesson. She finally agrees to teach him, but has difficulty when she realizes Ever won’t let anyone touch him. She helps him overcome his fear of touch, while he helps her try to deal with her leg. Through this process, both teach each other about life and, in the process, learn more about themselves than they ever thought possible. They even learn to trust each other. 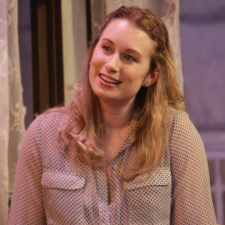 As the mad-at-the-world Senga, Kylie Clark, skillfully brings out all of her character’s anger and frustration. Her interactions with Ever are honest, whether they are at odds with each other or sharing an intimate moment. As Ever, Dean Knight steps into a character that in many ways resembles Sheldon on Big Bang Theory, especially when it comes to quirks and intelligence. Knight is a standout. He embodies the character, rambling off all of Ever’s scientific rhetoric with ease and finesse. He has respect for the way Ever thinks and feels, and it shows in his performance. Set designer Terrie Powers has outdone herself, creating a detailed, cozy apartment that provides a mirror into Senga’s life at the moment. Her set is as realistic as it gets. The two actors on stage aren’t the only ones that learn something during this show. Many of the facts and statistics Ever reels off help shed a light on autism and also the environment. Anyone who is looking for a neatly tied-up happily-ever-after moment – yours truly included – might be disappointed in the show’s hurried ending void of any definitive answers about the future. But most of the time life doesn’t wrap things up with a bow anyway. Dancing Lessons is a quirky, make-you-smile type of show. originally scheduled to close March 26, due to popular demand, it has been extended through April 9. The show is for ages thirteen and up. For showtimes and tickets, click here.